Brittany Bull and Sesam Mngqengqiswa may seem like your typical teenagers but these two girls have grand ambitions to launch Africa’s first private satellite into space in 2019. 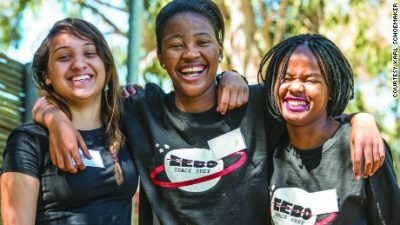 They are part of a team of high school girls from Cape Town, South Africa, who have designed and built payloads for a satellite that will orbit over the earth’s poles scanning Africa’s surface. Once in space, the satellite will collect information on agriculture, and food security within the continent. Using the data transmitted, “we can try to determine and predict the problems Africa will be facing in the future”, Bull, a student at Pelican Park High School explains. Information received twice a day will go towards disaster prevention. It’s part of a project by South Africa’s Meta Economic Development Organization (MEDO) working with Morehead State University in the US. This what young girls are doing in our sister country South Africa. They are aspiring to make names for themselves in this ever changing and advancing world but over here in Nigeria, teenage girls are being prepared for marriage. The annoying thing is that these girls who are being equipped for marriage are expected to do the impossible to keep the men they end up with even if these men are useless to themselves and to theses girls at the end of the day. Teenage girls are being taught that marriage is the ultimate achievement of a woman in Nigeria while teenagers all over the world are being equipped with education to stand tall in their different fields. Reading this article made me happy and sad. It made me happy because it is clear that girls are brilliant, intelligent and have greatness in them unlike what we have been told for long that women have fish brains and they are only good to cook, clean, and have children. I am sad because these could have been Nigerian girls but their mothers are still fighting side chicks to leave their husbands alone and scheming to remain married to irresponsible men instead of empowering their teenage girls to be the best they can be and go for their dreams.